Kernow a’gas dynergh – Welcome to Cornwall (4): An impressive horticultural legacy | A balanced diet . . .
Gardens. How many were designed and planted decades, even centuries ago, that can only now be fully appreciated? They were never seen in all their glory by their visionary originators. What a horticultural legacy they bequeathed to later generations. Trengwainton Garden, northwest of Penzance. All lie south of 50.2°N, and so there are many exotic species like tree ferns and bamboos that thrive under these conditions. And although these gardens would have been in their prime earlier in the year, with rhododendrons, camellias, and magnolias in flower, we saw enough during our exploration of these gardens to appreciate how they might look in another season. 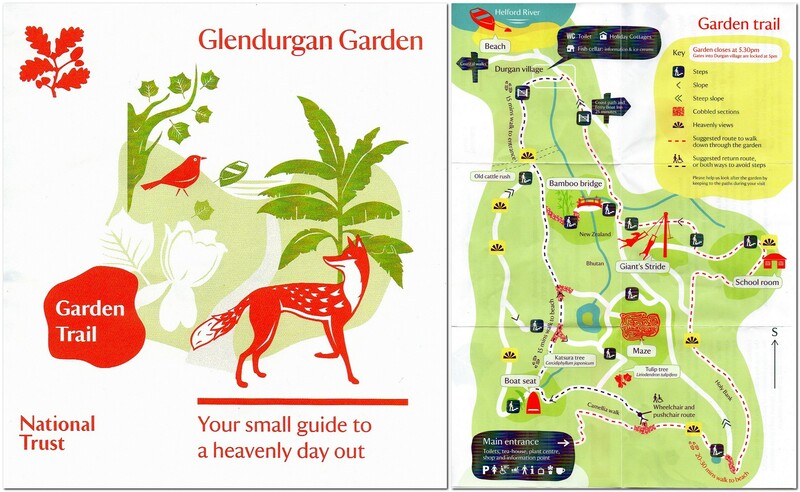 Glendurgan Garden was the first on our list. Having enjoyed a walk at Lizard Point earlier on this bright, sunny day, we looked forward to a pleasant stroll around the garden. The garden was planted in the 1820s and 1830s by Alfred Fox, and occupies a steep-sided valley down to the fishing village of Durgan, below Glendurgan House, home of the Fox family (not open to the public). We followed the red trail down to Durgan village, and came back up the brown trail on the left, taking in a viewing platform overlooking the maze (that was planted in 1833). It was a mizzly sort of day when we stopped by Trelissick on our way back to our holiday cottage after visiting another NT property northwest of Plymouth, Cotehele House. So we were never going to fully appreciate one of the triumphs of Trelissick: the panorama from the terrace in front of the house down to the shores of the River Fal estuary. 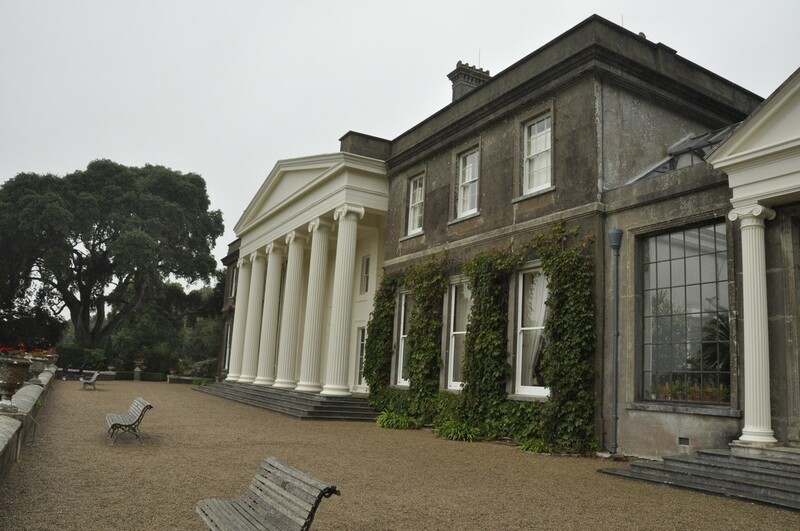 Trelissick was the family home of the Copeland family, owners of the Spode China factory in Stoke on Trent (I used to pass nearby everyday on my way to grammar school in Trent Vale in the 1960s). Just a few rooms on the ground floor are currently open to the public. It was passed to the National Trust in 1955. From the terrace, we made our way south through the garden, taking in the views (such as they were) from the tennis lawn (8) and the parkland (9) that did provide nice views back to the house. From Jack’s summer house (at the tip of the garden) we worked our way back up on the eastern side, crossing over the bridge into Carcaddon (11), then back towards the house across the main lawn (4). Take a look at the rest of the photos here. Godolphin has a particular claim to fame. In its various gardens, the King’s Garden (5) and Side Garden (14), it seems little has changed since at least the 16th century, maybe earlier. The Godolphins derived their wealth from some of the most important mines in Cornwall, the remains of which can still be seen dotted around the estate. On the day of our visit just the King’s Room was open to the public. The National Trust has a holiday let here at Godolphin, and mostly the house is off-limits to the general public apart from certain days per year. More photos of the garden can be viewed here. We also enjoyed the 1.5 mile walk to the top of Godolphin Hill, from where there is a 360° panorama to be enjoyed. Looking towards Land’s End from the top of Godolphin Hill. Northwest of Penzance, Trengwainton Garden offers magnificent views over Mount’s Bay, towards St Michael’s Mount in the east and Land’s End in the west. Only the garden, full of exotic shrubs (particularly bamboos and tree ferns) is open to the public, although there is access to the terrace (R) below the house from where the panorama can be enjoyed. Once again we were too late for many of the shrubs that flowered earlier in the year, but nevertheless our stroll through these leafy glades was rewarded by the view from the terrace. 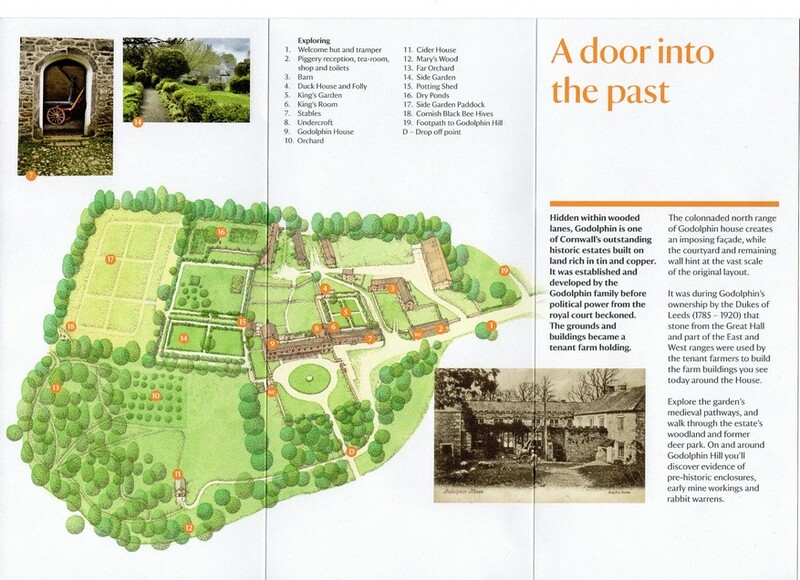 There is also an impressive walled garden, divided into several ‘rooms’ growing vegetables and ornamentals. On the day of our visit there was an exhibition of scarecrows made by local schoolchildren to celebrate the centenary of women getting the vote in the UK. More photos are included in this album. We enjoyed this horticultural tour of Cornwall, and of course the gardens at the various houses we also visited: St Michael’s Mount, Lanhydrock, Cotehele House, and Trerice. 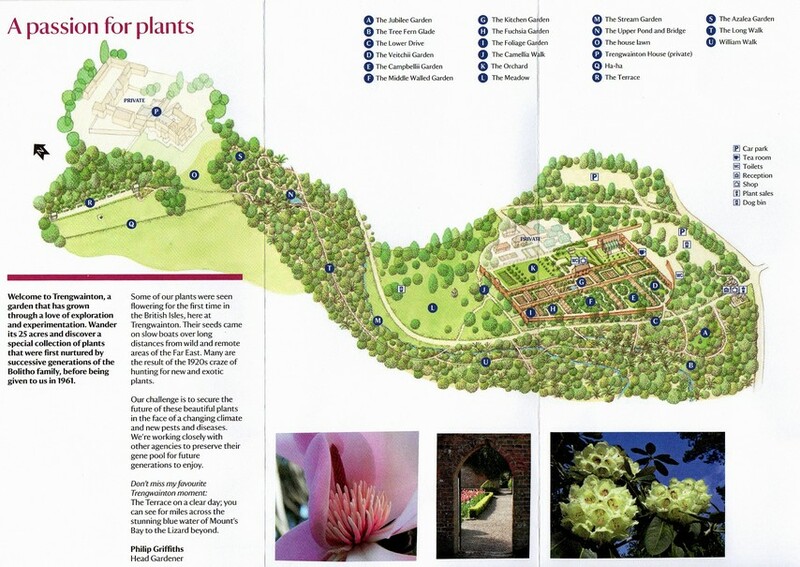 We decided not to visit the Lost Gardens of Heligan (which must also be included in Cornwall’s horticultural heritage) having more than enough on our itinerary of National Trust and English Heritage sites to add another. 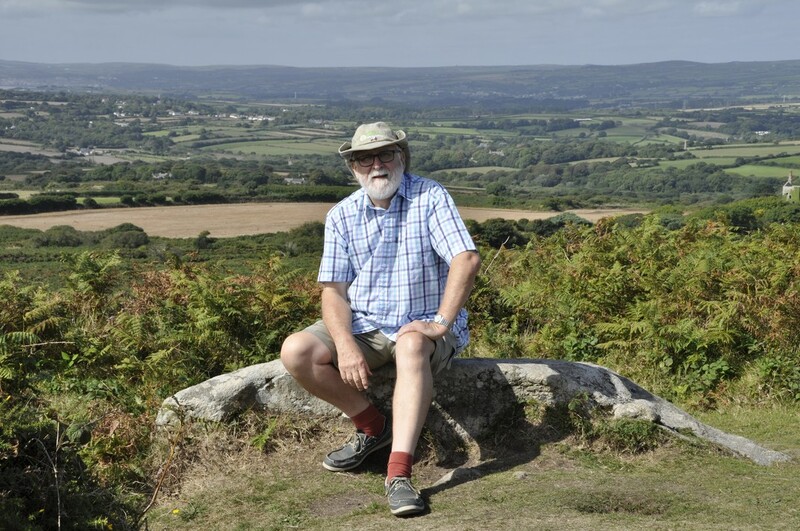 This entry was posted in Out and about, Travel and tagged Cornwall, gardens, Glendurgan Garden, Godolphin, National Trust, Trelissick, Trengwainton Garden.